At Furry Babies, we know exactly what it’s like to be head over heels in love with a Pug puppy! They are some of the most precious puppies and thankfully we have Pugs for sale in Chicago right here in our store. 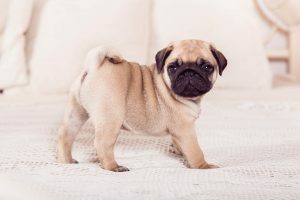 When you purchase one of our Pugs for sale in Chicago, you will also be armed with tons of information about how to care for them, starting right here with this blog! Take a look at some tips we’ve gathered to help you and your Pug puppies settle into each other’s lives comfortably. Feed them a proper diet. Just like with humans, dogs have digestive systems that don’t always absorb or digest nutrients from their meals, especially when they’re fed poor diets. Because these babies are prone to obesity, you must always keep them on a strict diet and feed them food that is breed-specific, preferably, or something of high quality. When you decided you wanted to find Pugs for sale in Chicago, you must have done so out of your love for Pug puppies. Perfect, because Pugs crave constant love and praise. They’re just sweet and adorable little guys and they are uberly affectionate and they quite frankly thrive from giving and receiving attention. Pay special attention to your Pug puppies’ teeth. Pugs with healthy teeth digest their food better and reduce the chances of intestinal blockages and stomach related illnesses. To properly care for their teeth, give them healthy foods and treats. They need hard but chewable bones to keep their teeth clean. They reduce plaque and tartar. We urge you to make and keep up with appointments with your pup’s vet. Pugs for sale in Chicago are little treasures and they should be treated as such! With the spring season looming around the corner, that also means pests! Use repellants like Frontline or those administered by your vet. You also want to keep your Pug protected from worms, by cleaning up their poop immediately after he’s relieved himself. Hookworms, for example, can easily be found in a pup’s stool and lay eggs in the grass for up to a year! Close contact with that poop can affect your Pug. Mosquitos are also pesky pests, so preventatively protect your Pug from them, too. If you have any questions contact us or if you need a referral for a veterinarian for Pugs for sale in Chicago let us know!